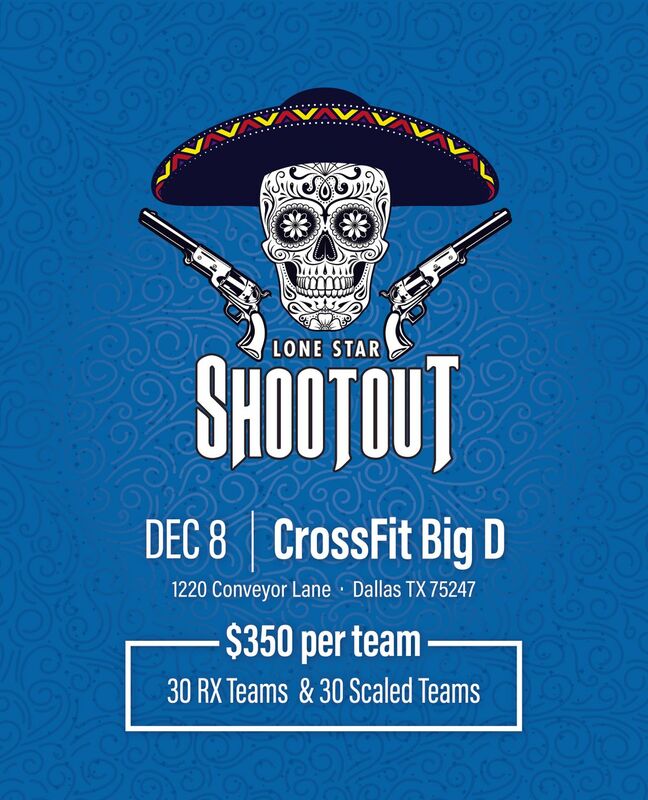 CrossFit Big D is proud to present The "Lone Star Shootout". 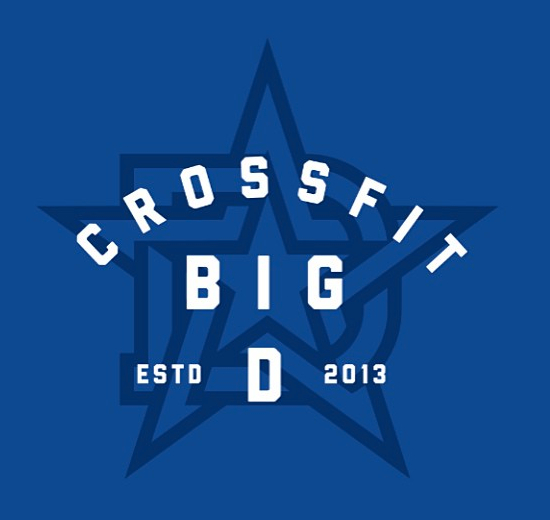 This is going to be a Texas sized Team Competition 2 Men and Women on each team that will be held at CrossFit Big D in Dallas, Texas. Want to know how you affiliate will stack up against the best in the Region this coming competition season? Well sign up and shoot it out with the best and see where you stack up! At 3 - 2 - 1 - GO.. Team members starting on their lane mats will do 500m Farmers Carry. They can alternate as much as they want but one person must carry one set. A Regional Caliber Competition deserves Regional Quality Equipment/ Rogue Fitness has signed on to be the official Equipment Supplier for the Lone Star Shootout! Compete Every Day embodies the spirit of Competition in our daily lives. We can think of no better way to outfit out Competitors and Volunteers than with the designs and spirit of Compete Every Day. All shirts designed and printed by Compete Every Day and you can get their gear onsite on competition day. MyoPux is the affordable and portable wireless TENS & EMS stimulation device. Operated with a touch screen display, simply synchronize the receiver (pux) with the controller, select a program, and set desired intensity. MyoPux was specifically designed to be thin and smooth enough to wear under your clothes. This makes on-the-go recovery your new reality. Sleek and intuitive, it's the ultimate plug-n-play device. RX First Place Team Members will ALL Receive their own Myopux Unit worth $300!! ALL Podium athletes in BOTH Divisions will receive their very own Leopard Claw with a Value of $150! The pioneers of the Recovery Center world, formally known as CryoUSA has now evolved and improved into Phoenix Regen Center. The leader in Performance Menswear, Mizzen+Main is the original and more innovative company on the market. Competition and Lululemon go hand it hand all the way back to the O.G. days of Fitness! We are proud of have Lululemon Knox Street apart of Lone Star Shootout this year as they will be donating apparel Gifts to every female athlete on the teams for both Scaled and RX Divisions for 1st/2nd and 3rd. Lululemon Knox Street is also giving every athlete 25% off their store location leading up the competition just for signing up! Kill Cliff, Inc was founded by a former Navy SEAL who grew tired of using motrin and caffeine-laden drinks to refuel his body after his daily workouts. Kill Cliff is a functional recovery drink made up of B, C, and E vitamins, electrolytes, and plant extracts including ginger root, green tea extract, and ginseng root powder as well as a unique enzyme blend. Ascent Native Fuel™ Whey Protein is the go-to post-workout recovery drink to optimize muscle health and performance. They have cut out the over processed middle man and just took it straight from the dairy farms themselves. All Registered Athletes will receive 2 Free Samples of Ascent Protein! Winning Teams in each Division will receive a Variety Pack of Simply Pre! The Crossover Symmetry exercises are designed to mirror the functional patterning of sport specific movements. They target common deficiencies and muscle imbalances to improve movement and athletic performance. Much of the magic behind Crossover Symmetry lies in the sequencing and programming “behind the bands”. Each exercise has a specific purpose and sequence to effectively address posture, scapula stability and rotator cuff function. America made eyewear for the most functional, elite and tactical athletes. Manufactured using a proprietary advanced injection molding process, with high optical grade polycarbonate materials, every pair of Gatorz lenses are crafted with unmatched optical standards that exceed global sunglass standards. Since 2009, we have worked side by side with our clients to offer individualized therapy, rehabilitation, strength and conditioning methods to ensure you move free. We regularly collaborate with leading sport scientists, researchers and healthcare professionals, and we are committed to challenging the status quo when it comes to optimizing your athletic performance. A protein packed puree in 6 different amazing flavors perfect for on the go fuel or middle of the day nutritional snacks. Fuel for fire is the go to food for all athletes at any level. All Podium Athletes will receive free products from Fuel for Fire! Bear KompleX (with a "K") was developed by a couple of very average athletes with slightly above average aspirations, and way above average palm rips from the Speal bar. We have worked to create a more comfortable grip unlike any other to enhance the experience for all fitness freaks. Our innovative styling protects your wrist from that pesky buckle, we use the best leather for quality and comfort, and we incorporate several colors and styles to enhance your performance.